Meringues - egg white and sugar nests of airy sweetness - are one of those old-fashioned desserts that wax and wane in popularity. Lately, they seem to have lost some appeal. Which is odd considering that macarons - a cookie-form cousin of the meringue - are all the rage these days. 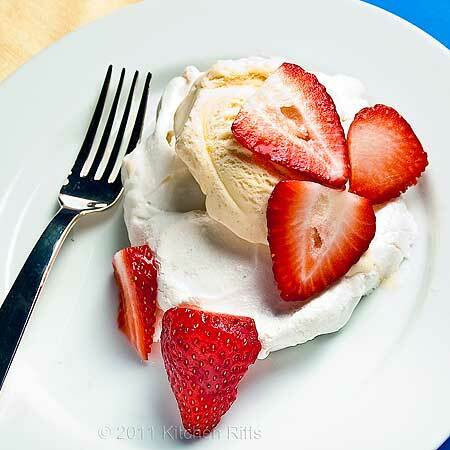 When I was a child, meringues were the special-occasion dessert at our house, served with vanilla ice cream and fresh strawberries, and sometimes whipped cream. Because meringues have the reputation of being somewhat finicky to prepare, I think my mother always mentally held her breath each time she made them. And she probably didn’t exhale until the first bite revealed that, once again, meringue success was hers. And speaking of mom, Mother’s Day is just around the corner. What better dessert to celebrate with than meringues? Although I’ve eaten meringues many times, I’d never made them. Until now. When I decided to do this post, I asked my sister, who is highly experienced in the craft of meringue making, to prepare a batch for photographic purposes and also contribute the recipe. She graciously consented, and the recipe is largely in her words. But I wanted to really understand the recipe, so I made a batch, too. My sister’s recipe is based on the one my mother used. But most meringue recipes are very similar (meringues being nothing more than whipped egg whites and sugar). Joy of Cooking has a particularly extensive and useful discussion on meringues that I found useful. This recipe makes 6 to 8 servings (meringue “nests”). Leftover meringues can be kept for a few days in an airtight container, or frozen for up to a month. Beat room-temperature egg whites until foamy in an electric mixer. If using, add vanilla, cream of tartar, and vinegar. While continuing to beat, add the sugar 1 tablespoon at a time. When the mixture stands in stiff peaks (which does not take long), it is ready for baking. 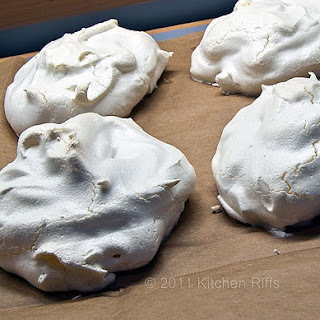 Spoon meringues onto a cookie sheet covered with parchment paper (you can also use a cut-up brown paper grocery bag; the parchment prevents sticking, as well as diffusing the heat). Form each serving into a “nest,” or mound of meringue. Bake for one hour (see notes). Check periodically, and cover loosely with aluminum foil if the meringue is browning at all. I generally put foil on top for the last twenty minutes. After approximately an hour, turn off the oven, but leave the meringues in for another five minutes or so (it doesn’t hurt if you leave them in longer; see notes). Cool. Immediately before serving, garnish the “nests” with a scoop of vanilla ice cream or whipped cream, and sliced strawberries. Or strawberry sauce. Or blackberries. Or whatever strikes your fancy. 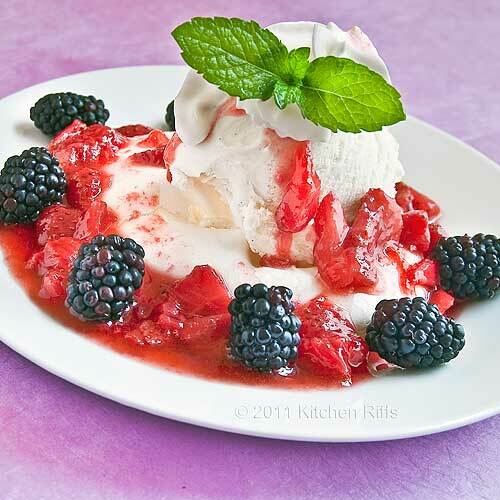 My favorite garnish is vanilla ice cream, strawberry sauce, a dollop of whipped cream, and a few blackberries. A sprig of mint provides a festive highlight. The picture at the top of the post illustrates how I like to assemble my meringues. When you “bake” the meringues, you are actually just drying out the egg whites. So “doneness” is really about evaporating the proper amount of moisture so that the meringue is crisp and crunchy rather than gooey, chewy, or runny. Some recipes suggest baking at 150 degrees for 2 hours (or more). However, health authorities recommend that meringues reach a temperature of at least 160 degrees Fahrenheit in order to kill any possible salmonella contained in the egg whites. My oven runs on the cool side, so even though I set the thermostat to 200 degrees, I’ll bet the heat was actually 10 or 15 degrees lower. I didn’t have any problem with the meringues browning, so I did not bother to cover with foil for the last 20 minutes as my sister suggests. But if you bake at too high a heat, they will brown, which you want to avoid. I cooked the meringues for about an hour and 10 minutes before I turned off the oven – and then left the meringues in the oven for 2 hours (this allows the meringues to cool slowly, preventing cracks). Mine turned out just a tiny bit chewy, which probably means I should have baked them for a few minutes more (another 10 minutes, I’d guess). Humidity can also cause meringues to be sticky or chewy (which is why some people say you shouldn’t make them on a humid day). If your meringues turn out a little runny or weepy, it means some of the sugar was not fully dissolved in the egg white. Many recipes call for adding acid (lemon juice or vinegar, in this case) and/or cream of tartar. These elements help stabilize the egg whites. (The sugar also helps with stabilization.) Professional cookbooks, like The Culinary Institute of America’s The Professional Chef, 8th Edition, don’t bother with cream of tartar or an acid like lemon juice because chefs find they’re not really necessary if you use good techniques. Me? I’m not a professional and my technique is shaky (desserts are not my forte), so I use cream of tartar. I don’t add lemon juice or vinegar, which serves the same purpose as cream of tartar. (I also don’t wear a belt and suspenders at the same time.) But using all the ingredients at once doesn’t harm anything. I’ve eaten meringues made both with and without vanilla, and I can’t tell much difference in flavor (particularly when they’re served with ice cream and strawberry topping). I leave out the vanilla, but feel free to use it if you can distinguish a flavor difference. Your mixing bowl and beaters much be clean, without a hint of grease, before the egg white touches them. Otherwise, the whites won’t mound (or will do so incompletely). When separating eggs, it’s important that not a speck of yolk be included with the egg white, otherwise you’ll have beating problems. Here’s the easiest and fastest way to separate egg whites from their yolks: First wash your hands thoroughly. Then crack the egg, open the shell into the palm of your hand, and let the egg white run through your slightly open fingers. I find that it’s fastest if I transfer the egg from one hand to the other once or twice during this process. I always separate eggs one at a time into a small bowl, and then transfer each egg white into the mixer bowl and the yolk into another bowl. That way, if I accidentally get some egg yolk mixed in with its white, I ruin only one egg, not the whole batch. Also, when I bring eggs to room temperature before separating, I always put out an extra egg or two just in case I have an accident with one of the eggs I’m separating. That way, I’ll have a spare. The most critical measurement in this recipe seems to be the ratio between egg white and sugar. A “large” egg is 2 ounces. Four whites from 2-ounce eggs require 8 ounces (½ pound) of sugar in order to mound properly into stiff peaks and have the correct consistency. Usually 8 ounces of sugar fills a cup. But humidity or other factors can cause that to vary a bit, so it’s best to weigh your sugar (instead of just scooping the cup in the sugar bin and then leveling off). Weighing ensures that your measurements are correct. Although this recipe calls for regular granulated sugar, some recipes specify superfine or powdered sugar. The theory is that these sugars will dissolve quicker and produce a meringue with a finer texture. Using superfine sugar is probably a good idea. Most recipes for meringues and macarons call for adding sugar a tablespoon at a time. I really wonder how necessary this is. In the Brave Tart blog, author Stella Parks, a professional baker and graduate of the Culinary Institute of America, defies this conventional wisdom. In a truly excellent post on making macarons, Macaron Mythbusters, she says that she just dumps all the sugar in at the beginning of the whipping process, and her macarons turn out fine. (She also makes Swiss meringue for buttercream 6 times a week, using the same technique). But . . . the C&H Sugar Website claims that adding sugar gradually produces more voluminous egg whites. Next time I make meringues, I’m going to add all the sugar to the egg whites right at the beginning. I’ll update this post with my observations about how that turns out. Despite their “fussy” reputation, meringues are simple to make. 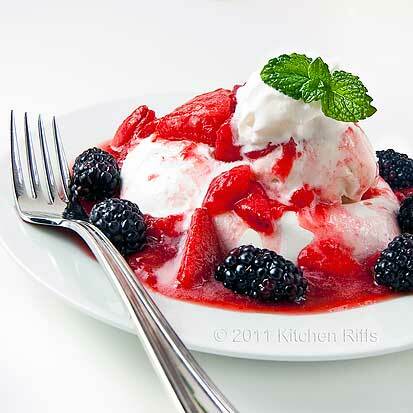 They’re also delicious, and create an ideal base for toppings like ice cream and strawberry sauce. A fully decked-out meringue is colorful, elegant, festive — and downright luscious. These classic nests of sweetness make the perfect dessert for Mother’s Day. They may even evoke some cherished memories. Your mom will love them. And you too, of course. Hi Liz, thanks for your comment! Meringues really are very good, and even better, they're pretty easy to make. Looks delicious. Félicitations to you and your lovely sister! @ Max, thanks. Glad you enjoyed it. I tried my first meringues a few days ago and had decent success but I want to try it again. Yours look beautiful! Hi Lucy, meringues are fun to make, aren't they? Thanks for the compliment on the photos. I love meringues! They are one of my favorite because they are sort of a blank slate for what you want in them/ flavoring them, and they aren't rich (which is good for my body). Plus, they are fun to make I think. I love whipping up the egg whites! @Anne, thanks for the compliment! Meringues really are pretty easy to make, and so good. I think you'd enjoy making them. @Meri, thanks for your comment! You're right, meringues really aren't rich (the toppings, on the other hand . . .). Plus I think they're really pretty just by themselves, without toppings added. Great post! I make meringues at the beginning of summer every year and store them in tins to make a quick summer dessert. 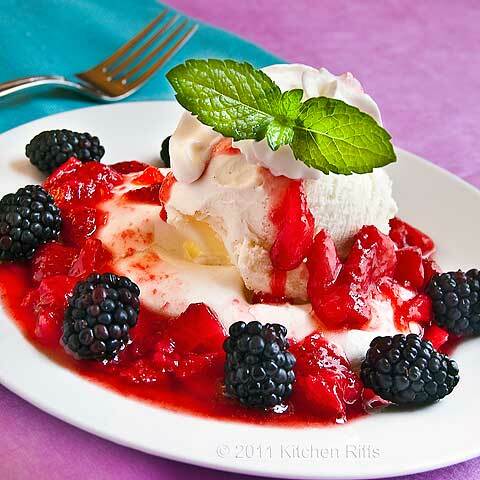 My favorite is Pavlova's, the Australian dessert which is with fresh berries and whip cream. I make them with a little dent in the center, like a nest, to hold the berries. I use the backside of my spoon to make the nest. Hi Kathleen, I haven't heard of Pavlova before. Sounds delicious. I'll have to give that a try. Good tip re the back of your spoon to make the nest, too. Thanks for the comment. Did I mention that I love meringues? (You might have guessed that.) I have one recipe that uses vinegar and one that uses cream of tartar, and I didn't stop to think why until I read this post. Thanks! Oh, and I love Pavlova too. Hi Beth, I gather from your other comment that meringues were one of your favs! They're great, aren't they? We haven't done Pavlova - really need to do that. Thanks for the comment.